September 11, 2009 by riamn. Average Reading Time: about a minute. Rochester International Association is proud to announce that the CAAM Chinese Dance Theater (CDT) is performing for the first time at Rochesterâ€™s Mayo Civic Center on Sat., Sept. 19 7PM. 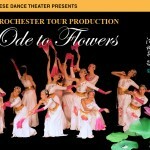 The “Ode to Flowers” performance will involve more than 80 dancers, some of which are from Rochester. Jasmine flowers welcoming spring. Bamboo stalks bending with the wind. Plum blossoms enduring the bitter snow. Peonies displaying their special meaning in life. Ode to Flowersâ€ is an ambitious production, one that showcases a high form of Chinese culture in a harmonious blend of dancing, painting and poetry. Unlike previous CDT shows, it will be a blend of classical Chinese and contemporary choreography. This touring production, first presented to Twin Cities audiences, features dances performed for the first time in Rochester and the surrounding area. Visit the Chinese Dance Theater website for more information about the dance concert. CAAM Chinese Dance Theater is dedicated to preserving and celebrating our Chinese cultural heritage and enriching the cultural life of all Minnesotans through the universal language of dance.